Fly Tyers Scott Biron is pictured with Writing on the Fly's George Liset at the big Fly Fishing Show in Marlborough, Mass. It is January, and it is zero degrees out. I beat a path between the window and the calendar trying to hurry spring. With each trip, I feel like the collar of my shirt tightens a little more around my neck. It has been almost two months since I have been on the river with my fly rod. I feel like I am going stir crazy. This feeling is known by many names. The fishing writer John Gierach calls it the “Shack Nasties.” Most around here call it cabin fever. Whatever you want to call it, I don’t like it. There are many ways to combat this feeling. Some like to go ice fishing. Ice fishing is a nice alternative to get you through the cold months if you have a great ice shack with a heater and other amenities. Another alternative is to go some place where they have a lot of fly fishing gear and other fly fishers you can talk to about fly fishing. With this in mind I headed down to the big Fly Fishing Show in Marlborough, Mass. The Fly Fishing Show did not disappoint; there were lots of people and lots of gear. The Royal Plaza Trade Center was set up with a large casting pool in the middle of the floor for casting demonstrations and vendors all around. I decided to do a quick walk through the first time through, then go back and take my time the second time through. 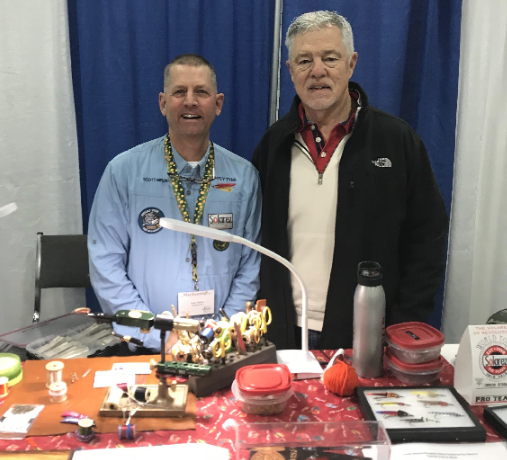 As I did, I was able to catch up with old friend Scott Biron who is a fly tyer from Bradford, N.H. Scott teaches fly tying classes for the state of New Hampshire Fish and Game. Scott does some amazing work. Scott’s specialty is tying streamers. I had to pick up a few because they were so beautiful and well-done. They are almost too beautiful to use and will probably go into my fly collection. The casting pool was fun to observe while wandering between booths. There were a number of demonstrations and the pool was also able to be used for people trying out new fly rod and reel combinations. It is nice to be able to try out a rod before you plunk down a few hundred dollars. One of my favorite things to do during the summer is to go to Orvis in Manchester, Vt. to try out their new rods on their outdoor casting ponds. From left, George Liset, Dr. Barbara Lynch, and John McKernan at The Fly Fishing Show in Marlborough, Mass. 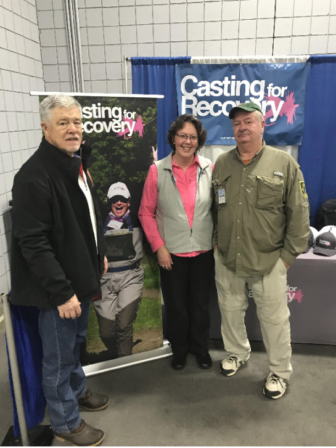 As I continued my wandering, I caught up with some other friends at the Casting For Recovery booth, Dr. Barb Lynch and New Hampshire guide John McKernan. John was donating a guided half-day trip on Great Bay for Stripers. Dr. Barb is a cancer survivor who teaches in Dover and is an accomplished fly fisher herself. John, who is a former teacher, was telling us about his new boat and how well it is adapted to handle the exciting action of catching Stripers on Great Bay. I have already signed up with my son to join him this summer. John is an incredible resource for all things fly fishing, having traveled extensively as a fisher and a guide. I was all excited about fishing for Stripers when my son asked me if I had another 8 weight fly rod. “Another?” I asked. Then with a chuckle, he reminded me that I let him “borrow” my only one. I was thinking that I was doing so good. I was going to leave the show without a big purchase. Luckily John pointed me to a booth where I got a sweet deal on a new 8 weight. As I was leaving the show, the collar around my shirt seemed a little looser. I was heartened by the fact that the days will be getting longer and on March 10 the clocks will spring ahead, which will mean more time to fish after school. 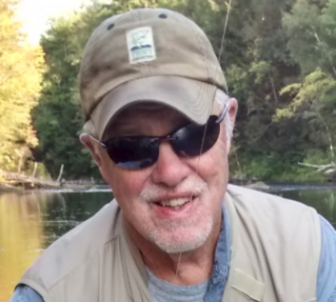 A writer from Dover, George Liset writes about all things Fly Fishing. George has worked as a lobsterman, lifeguard, wrangler, boat captain, fishing instructor, and has traveled in most of the lower 48 states. Upon graduation from Wheaton College, Illinois, George began his teaching career and currently teaches in Dover and has coached Track and Field most recently at UNH. Liset has been published nationally and internationally in the area of track and field and coaching.